Coming from a family of teachers, I was expected to have an extensive list of summer reading materials as soon as I was able to sound out words! Looking back, I’m sure this was intended to keep me busy and out of my mother’s hair during the long, hot summers in the small town of Elmira, NY in the southern tier. My mother, my two aunts and my sister were graduates of Elmira College, all majoring in literature, and took pride in the fact that the Mark Twain Study, where Samuel Clemens penned many of his books, sits on the campus of their alma mater. The study was once located on Quarry Farm, owned by his wife’s sister, Sarah Clemens. Many people believe she had it built for him as a quiet place to write, and that is partially true. Within in the walls of this octagon shaped pavilion warmed by a stone fireplace, Clemens penned The Adventures of Tom Sawyer, The Prince and the Pauper and the Adventures of Huckleberry Finn. However, Clemen’s sister-in-law, Sarah, may have had an ulterior motive: he smoked cigars constantly, and Susan did not want him to do so in her house. We visited the study every summer and thus began my love for reading. We had an attic full of complete volumes of The Bobbsey Twins, Nancy Drew, The Hardy Boys, and The Happy Hollisters to name a few. One of my favorite activities once school let out for summer was to race to the attic to see which books I might read next. I could relate to the cast of characters who were my age and so adventurous! Nearly every afternoon around 4:00, my mother and I would head to our porch, lemonade in one hand, book in another, and read until 5:30 – at which time, my dad would come home from work and mom would trade her lemonade for a “high ball”. I look back to those “lazy, crazy days of summer” with fondness. My reading took me to places I’d only dreamed of like the seashore with the Bobbsey’s and River Heights, Nancy Drew’s hometown! What a gift it was to be encouraged to read. So, I’d like to begin with recommending two books for my audience at Ashton Place. I think you will enjoy them and perhaps relate to the characters and their stories. So, dust off your patio furniture, grab a cold glass of lemonade, put your feet up and enjoy the ride! It would be the adventure of a lifetime for anyone else, but Allan has a larger-than-life backstory: Not only has he witnessed some of the most important events of the twentieth century, but he has actually played a key role in them. Starting out in munitions as a boy, he somehow finds himself involved in many of the key explosions of the twentieth century and travels the world, sharing meals and more with everyone from Stalin, Churchill, and Truman to Mao, Franco, and de Gaulle. 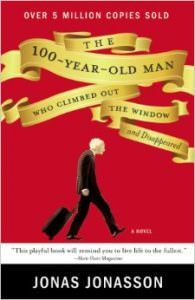 Quirky and utterly unique, The 100-Year-Old Man Who Climbed Out the Window and Disappeared has charmed readers across the world. Click here to purchase on Barnes and Noble online. Fredrik Backman’s novel about the angry old man next door is a thoughtful exploration of the profound impact one life has on countless others. This criminally fun story is set in a fictional retirement community called Diamond House. 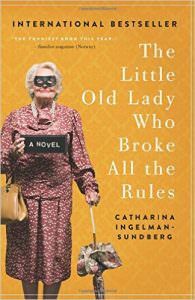 Its author takes this group of seniors fed up with new management, from their retirement community in Stockholm to the bright lights of Vegas! Martha Andersson may be seventy-nine-years-old and live in a retirement home, but that doesn’t mean she’s ready to stop enjoying life. So when the new management of Diamond House starts cutting corners to save money, Martha and her four closest friends—Brains, The Rake, Christina and Anna-Gretta (a.k.a. The League of Pensioners)—won’t stand for it. Fed up with early bedtimes and overcooked veggies, this group of feisty seniors sets about to regain their independence, improve their lot, and stand up for seniors everywhere. Stay tuned for Part II of Recommended Summer Reading! Want to read more from Virginia Tortorici? Click here!